There was magic in Carnivàle. The show featured a multitude of gripping stories and plot twists in every episode, fantastic multidimensional characters that you really cared for, breathtaking performances from outstanding actors, mesmerizing cinematography in an incredible universe, all blessed with a wondrous soundtrack. The setting was the 1930s dust-bowl, and we followed the journey of a traveling circus consisting of strong-men, snake-women, contortionists, hustlers, pimps, healers and other freaks, trying to get along with each other and make a living. The life of a carnie was not a clean one, and the behind the scenes features show how actors were frequently sent back to make-up during filming, to make them look more dirty, more ragged, more alive. There was no glamor on Carnivàle. The people on this show looked real. Although all the actors did a very good job, there was one who stood out, in the role of his career: Clancy Brown. Shepherding his flock as the priest of darkness, the guttural commandments of his voice will make you shiver. And it was simply the best thing to ever come on TV. There's nothing to compare it to, because it doesn't look like anything else. Sadly, the show inevitably proved larger than itself, as was canceled after 2 of 6 planned seasons. Now, if the show was this great, then why was it canceled? The answer is nothing but infuriating: At the original airtime, HBO (who produced the show) started to make another expensive show, Rome, and suddenly found they couldn't afford to finance both shows. So they cancelled Carnivàle to make room for Rome. However, shortly afterwards the sets of Rome burned down, and it was all in vain. Still, the legacy lives on among fanatical fans all over the world. It even inspired the creation of a real life, present day Carnivale. Heck, I loved the show so much that I left town and joined a carnival on my own, and traveled with them for 5 weeks. 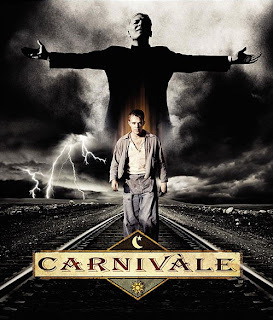 I loved Carnivale, it was amazingly addictive, despite the fact I usually had no clue what was going on. I agree with your parise of Clancey Brown. Another interesting actor in the series was Patrick Bauchau as Lodz. one of his first roles was the lead in Eric Rohmer's "La Collectioneuse" in 1967...what a career! Hehe, I just watched it for the 4th time. Still just as awesome! Yep, seen and like them both, especially the first one.